Every Managed VPS comes with SSDs, guaranteeing the fastest response possible for applications hosted on the server. Managed VPS is a solution for everyone in need of a reliable and manageable hosting service; no system administrator knowledge is needed. Recommended hosting solution for medium load websites, large databases, and applications that need specific server settings. Recommended for high-load websites, large databases, and applications that need specific server settings. Recommended for relatively large and high-load applications - portals and news websites, online stores, corporate websites with multiple mailboxes, CRM, ERP systems, and more. Recommended for very high-load applications, websites, and portals that generate hundreds of server queries per second, CRM and ERP systems with multiple users, and complete corporate hosting solutions for medium- and small-sized companies. We manage the virtual server administration, so you don't have to - you just run the server and manage the applications hosted on it. We are highly experienced and guarantee the highest possible server security. All Managed VPS Hosting services come with a pre-installed and pre-configured control panel (cPanel). cPanel is the most widely used hosting control panel in the world and is designed so that users who are not familiar with system administration can use it with ease. cPanel lets you manage the server’s resources and the applications hosted on it. When you choose Managed VPS Hosting services you have the freedom to host the applications you want on the server. And this includes applications not compatible with shared hosting because they’re either too bulky or just specific. Your apps can use all of the resources as defined by the selected plan. To achieve greater server security, the content hosted on the server gets a backup several times a week. In case of a server issue or unauthorized content deletion (damage), we can quickly get your website back on track. Thanks to ALL SSD technology, client websites load up to 10 times faster compared to websites located on ordinary HDD disks. For every email there is intelligent SPAM protection activated. Intelligent SPAM protection has machine learning system which betters SPAM protection a lot. Maximum allowed number of directories, files, and symlinks that may be located in a single hosting account. CPU time indicates the time spent by the processors for dealing with the scripts hosted on the server. The indicated values are relative and refer to the values under which the applications will run best. Manage your WordPress website quickly and easily with our specially developed cPanel plugin WordPress Manager by SuperHosting. It allows you to install WordPress with only a few clicks, check your website’s level of security, speed up loading, recover data from a backup, etc. HTTP/2 is the latest HTTP version which enables browsers to load websites faster. All of our hosting plans support HTTP/2 so that your visitors can load each web page much faster. SuperCache can speed up your website up to 100x! SuperCache is a web server caching mechanism, which is able to cache static and dynamic content of your website. Once a given page is cached, it will load much faster for all future website visitors! Speed up your website with Меmcached! Memcached is an open-source software used to accelerate the operation of dynamic websites. Activate it from your cPanel, menu Memcached Manager by SuperHosting. Redis is a caching module used to speed up websites. Activate Redis from menu Redis Manager by SuperHosting in cPanel. You can find the script library (Softaculous) in the server control panel (cPanel). Softaculous lets you install more than 300 different web applications in your account, including CMS (Joomla, Drupal, WordPress, and others), e-stores (PrestaShop, Magento, OpenCart, and others), forums, galleries, ERP systems and more. Up to three server backups are generated on a weekly basis. Some file types are excluded from the backup. The full backup option (VIP backup) of the virtual server content includes the generation and storage of seven backups per week, which includes all files. SSL certificates gain your customers' trust and provide web users with the necessary level of security when they have to enter confidential information. The SSL protocol provides an encrypted connection between the server (your website) and the customer's browser, and in this way, it protects the exchanged information against unauthorized interception. Additional feature for supporting different Python versions can be activated upon request. Python is a popular programming language for building interactive projects. By supporting different Python versions we provide necessary version for correct work of Python based frameworks as Django. 24/7 live monitoring and quick response if a problem arises. For each Managed VPS plan, SuperHosting.BG provides free (24/7) tech support over the phone, email, and through a dedicated ticketing system. The DDoS defense system protects the hosting services on a network level. It helps the website run normally by neutralizing DDoS attacks targeting our equipment. The system detects 95% of the known types of DDoS attacks. Provides by all Internet providers. The system tracks down and detects unauthorized third party access attempts to access emails located in the hosting account. The system helps prevent the unauthorized access attempts to customers mailboxes for the purposes of data abuse and sending SPAM messages. The system helps prevent the unauthorized content publishing attempts (SPAM) in the form of opinions and comments in blogs, forums, and any websites, while allowing content publishing from authorized users. Defense against stealing login credentials for WordPress, Joomla, etc. The system defends login credentials from being stolen, preventing unauthorized access attempts to popular CMS systems' admin sections. The system protects websites from actions aimed at compromising a website by taking advantage of common mistakes and security vulnerabilities. 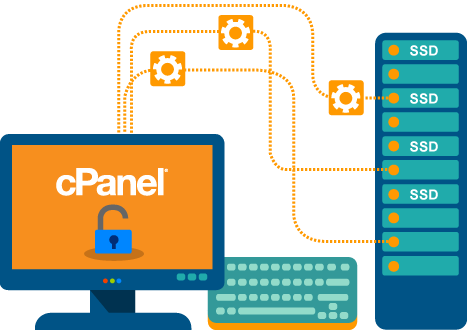 cPanel is a reliable and easy-to-use control panel. It is developed so that even users without any technical knowledge may be able to use it easily to manage their web projects. This option is used for uploading, downloading, deleting, changing the permissions of files, etc. directly through the cPanel. The file editor allows editing of the file content directly on the server through the cPanel. FastCGI is a script processing protocol for various programming languages. It provides high efficiency and speeds up website performance. APC, eAccelerator, Opcache are caching modules that enhance PHP script performance. By caching PHP scripts, their execution is not necessary at every request. They are executed once and the result is saved, usually to the RAM, and later on, this result can be provided for any following requests for execution of the same script. Various PHP modules are supported on our servers and can easily be activated from the cPanel -> `PHP Manager by SuperHosting`. See a list of supported PHP modules. The user-friendly interface allows you to change PHP settings (PHP directives). The most often used directives are selected in accordance with the chosen PHP version. You can edit a PHP.INI file yourself in the hosting account, so that the settings may correspond as much as possible with the application’s needs. You can track site visitors, generated traffic, site indexing by search engines, and much more in the cPanel. MIME types provide browsers with information on how to process files with certain extensions. For example, text/html mime type corresponds to .htm, .html, and .shtml extensions. This provides an option to track and control active server processes for a specific hosting account through a user interface, and it’s a very useful option for site development and diagnostics. Tracking and support of the inodes system parameter allows seamless backup generation and provides excellent file system efficiency, which results in quick loading and performance of any websites. For easier administration of databases located in the hosting account, we offer the option for remote access via a secure VPN connection. The script library (Softaculous) can be found in the control panel (cPanel) of the hosting account. With just a few clicks, Softaculous allows you to install to your account more than 200 different web applications, including CMS (Joomla, Drupal, WordPress, and others), e-stores (PrestaShop, Magento, OpenCart, and others), forums, galleries, ERP systems, and more. You can check your emails both by using an email client (IMAP or POP3) and through web mail, with the option of choosing between three different mail clients: Horde, RoundCube, and SquirrelMail. For each mailbox created, you can enable the SpamAssassin SPAM filter and set it up so that it filters mail according to your needs and other specified criteria. For further details on activating your SPAM filter. Support for iPhone, iPad, Android devices, Windows Phone, etc. You can set up various email filters in your cPanel to filter incoming messages according to criteria that you have specified. The filters, once they are set up, can be applied to all mailboxes in a hosting account or for a specific mailbox only. For further details on filters set up and management. You can set up additional email addresses for forwarding through the cPanel. This is a useful option if, for example, if you would like to receive a copy of your inbox to a different email address. For further details on email address forwarding. IMAP (Internet Message Access Protocol) is a protocol for checking email, where the received messages are not downloaded to the client`s computer but are read and managed directly on the server. POP3 (Post Office Protocol 3) is a protocol for checking emails. With this protocol, messages are downloaded from the server and stored on the client`s computer. An additional setting is possible, so that copies of the messages are transferred directly to the server. SMTP (Simple Mail Transfer Protocol) is a protocol used for sending electronic mail. The plans we offer include SMTP support and an option for sending emails. You can check your mail through encrypted (SSL) connection, so your correspondence will be as secure as possible. You get a free month if you prepay the server for 12 months. *Order a server for 12 months and get one month for free.